Bobby Brown is reportedly “in and out of crying fits” after the death of his ex-wife Whitney Houston. Bobby Brown, 43, decided the show must go on and still took to the stage to perform with his band New Edition, just hours after Whitney Houston’s sudden and tragic passing. During his concert in Mississippi, Bobby Brown tearfully shouted: “I love you, Whitney,” as he blew kisses to the sky. According to Us Weekly, Bobby Brown received huge applause as he came onstage late, after apparently breaking down just before the show was due to begin. A source told the publication that Bobby Brown broke down during his performance of the ballad Tenderoni, and asked the audience to sing along as he sobbed. Bobby Brown was then unable to finish the song and walked off, with the concert finishing shortly afterwards. A relative of Bobby Brown has said that he is “shattered and beyond devastated” at the news. Whitney Houston died this afternoon at the Beverly Hilton hotel in Los Angeles, aged 48. A spokesman for the local police department said that emergency services had been called to the hotel at 3:43 Saturday afternoon, arriving minutes later. Officials rushed to the room on the fourth floor where Whitney Houston was staying as a guest, where they found security staff attempting to revive her. Life-saving attempts were unsuccessful, and Whitney Houston was pronounced dead at 3:55 p.m. The cause of death is as yet unknown. TMZ also reports that, according to hotel staff, Whitney Houston “partied heavily” with friends last night, who were all drinking in the bar and making lots of noise. Bobby Brown and Whitney Houston had a notoriously turbulent relationship that was riddled with drug use and marital problems. 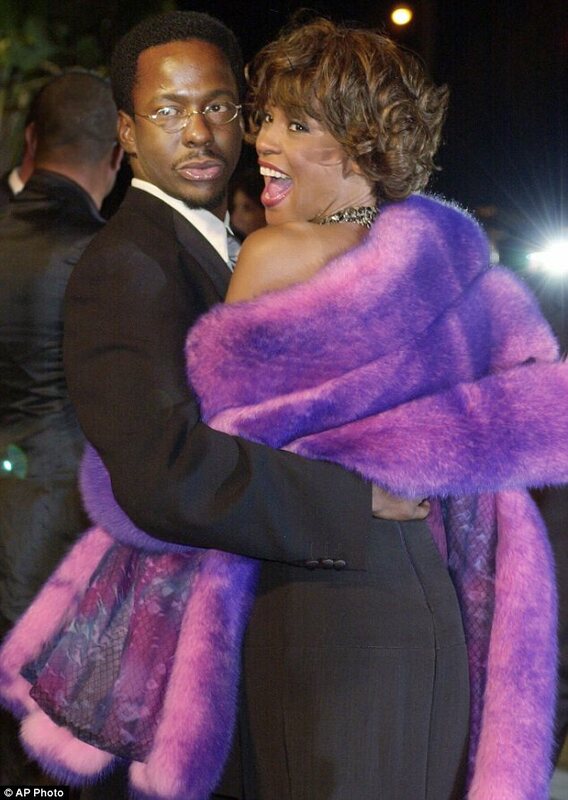 Whitney Houston admitted that she and Bobby Brown took cocaine and marijuana together through their 14 years of marriage. During this tumultuous time, Bobby Brown was arrested for drugs and alcohol and Whitney Houston entered drug rehabilitation programs twice. Whitney Houston and Bobby Brown wed in July 1992 and eventually separated in September 2006, before their divorce was finalized in April 2007. Three years after their split, Whitney Houston described her troubled marriage to Bobby with the poignant words: “He was my drug”. Whitney Houston and Bobby Brown have an 18-year-old daughter together, Bobbi Kristina. Despite Bobby Brown and Whitney Houston’s rocky relationship, the trio were reunited last week for a slap-up meal together. Whitney Houston looked happy as she left the Beverly Hills eatery after dinner, and was followed shortly after Bobby Brown and their daughter Bobbi Kristina, who held hands as they headed off together. Whitney Houston won custody of Bobbi Kristina following her divorce from the R&B star, with Bobby Brown being allowed visitation rights. However the pair’s last public outing together showed they seemed to have put their toxic past behind them.